Early in 1958 the postage rate for printed matter was increased and so the 1½d stamp was withdrawn and surcharged 2d. 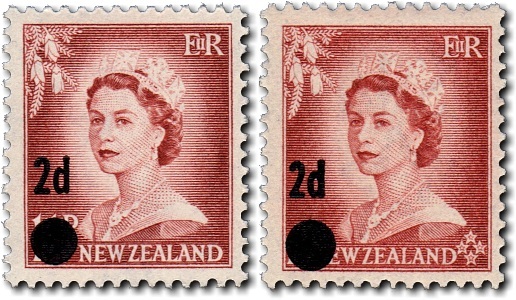 The newer 1½d stamp with large figures had been on sale for two years, but a few sheets of the original 1953 issue were returned and some of these were accidentally surcharged as well. 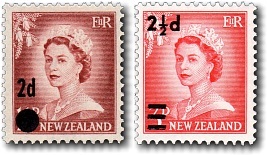 The 'Stars Overprint Error' can be easily detected (on the right in the photograph above) - the incorrectly surcharged stamps have the Southern Cross visible on the bottom right of the stamp.